Jumanji 3 has officially kicked off production. Sony Pictures wasted absolutely no time in getting a sequel to 2017's surprise breakout hit Jumanji: Welcome to the Jungle going and, despite Dwayne Johnson's incredibly busy schedule, not to mention trying to wrangle up the rest of the stacked ensemble cast, the studio has made quick work of it and filming is now underway, with a debut in theaters coming later this year. Assuming they stick to the current timeline, that is. This news comes to us directly from Dwayne Johnson himself, who is very active on social media and uses his platform to keep his followers informed about his goings-on. In this case, he gave everyone a little Valentine's Day gift in the form of the first photo from the movie, to go along with the announcement that filming has begun. Here's what Johnson had to say about it. "Happy Valentines Day. Wanna play a game? 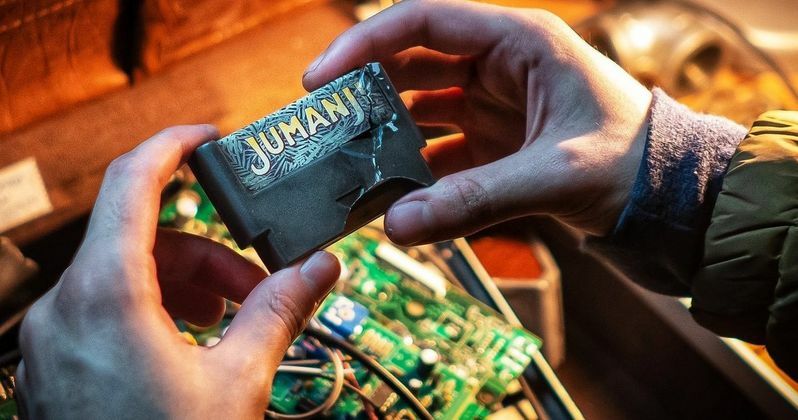 Here we go.... #StartOfProduction #Jumanji"
The photo itself isn't all that telling, but it does feature the same video game cartridge that got the group of teenagers into trouble last time around. It's being held by an unidentified figure above a bunch of scattered circuit boards and wires. Did something happen to the gaming console this game was played on in Welcome to the Jungle? Does that have something to do with the events that will be set in motion in this third installment? Since we don't even have an official synopsis yet, that's very hard to say. What we do know is that the core cast, consisting of Dwayne Johnson, Kevin Hart, Karen Gillan and Jack Black are all going to be back, so the video game avatars from the last movie will come into play. In addition to the returning cast members, several major new additions have been revealed over the last month or so. Awkwafina (Crazy Rich Asians, Ocean's 8), Danny Devito (It's Always Sunny in Philadelphia, Dumbo) and Danny Glover (Lethal Weapon, Sorry to Bother You) have all joined the ensemble in as-of-yet unspecified roles. But this thing is loaded down from top to bottom with star power. Jake Kasdan, who helmed the previous movie, is back in the director's chair, working from a script he co-wrote alongside Scott Rosenberg, and Jeff Pinkner, who both worked on the last movie as well. Jumanji: Welcome to the Jungle, a sequel to the 1995's Jumanji, which starred the late Robin Williams, served as a major surprise. Despite going up against The Last Jedi at the box office, it earned a stunning $962 million worldwide, largely thanks to favorable reviews and very positive word of mouth. Can Sony manage to recapture that lightning twice? They're certainly working on an ambitious timeline, as Jumanji 3 is currently scheduled to hit theaters on December 13. Be sure to check out the first photo from Dwayne Johnson's Twitter account below.